This is one of our archived dishes that is just now coming out! This is an attempt to recreate a childhood favorite. When we were growing up, our family would get invited by this other family who held quite the gatherings. From what I remember, they had an expansive buffet with various stations set up on their lawn. One of the stations was the griddled prawn station. 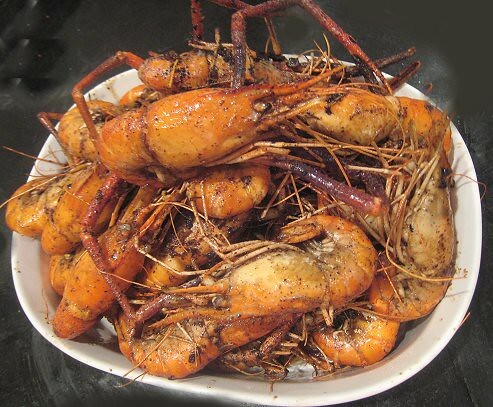 This being the Philippines, when we say prawns, we mean actual prawns as large as one's hands, maybe larger. 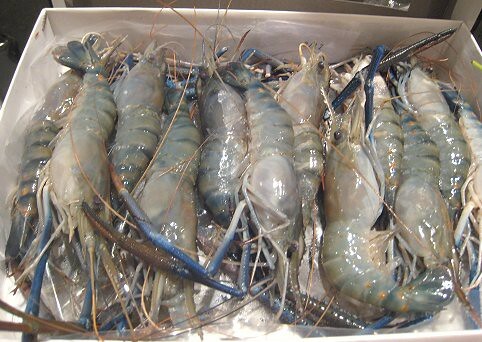 A lot of "prawns" we see in North America are merely shrimp. 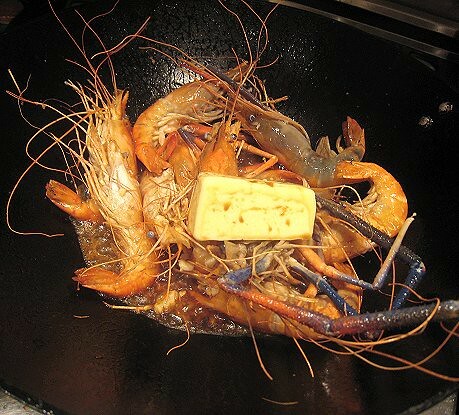 At this magical griddled prawn station, each prawn would be butterflied at the back, then put on the griddle, basted with the heavenliest of concoctions. 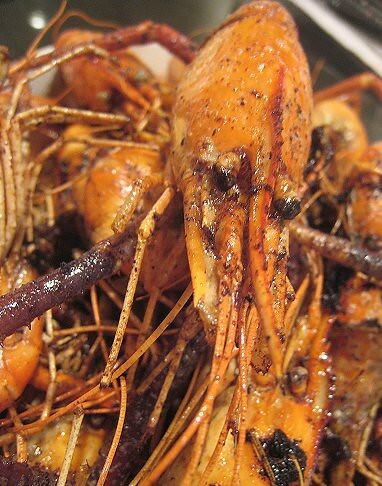 When we saw these Thai blue prawns, we thought it was time we attempted a re-creation. Of course, JS and I don't actually know what went into making that dish. Thinking back, our best guess is this. A whack-load of butter, garlic, and Worcestershire sauce. We were aiming to capture that elusive flavor from the past, and did not bother so much with sticking to the griddle method. Perhaps it's because we didn't have a griddle large enough to hold all the prawns, and that would have resulted in dreaded batch-cookery. For simplicity's sake, we threw in the butter, garlic and Worcestershire sauce into a wok and added the prawns. They needed to be tossed around quite a bit for each one to have a turn cooking in the butter/sauce. Maybe we needed to batch-cook them after all. Along the way, we seemed to have determined that the dish needed even more butter. After making sure the final guy had a dip in the garlicky, Worcestershire-y butter, the dish was done. Of course, being drenched in butter, garlic, and Worcestershire sauce, this could only be fantastic! But, is this the same dish as the one at that griddle station? I don't know. I think we probably did not re-create that same dish. I have a nagging feeling that our attempt falls a little bit short. 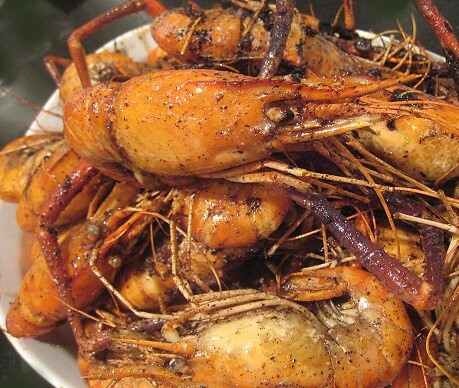 Or, maybe this dish is actually better than the griddled prawns of our childhood. I truly can't say. This dish can be done to taste. Use as much or as little of each ingredient as you wish. Heat your pan or wok. Add the butter, garlic, and Worcestershire sauce. When the butter has melted, add the prawns. Toss until the prawns have turned color. 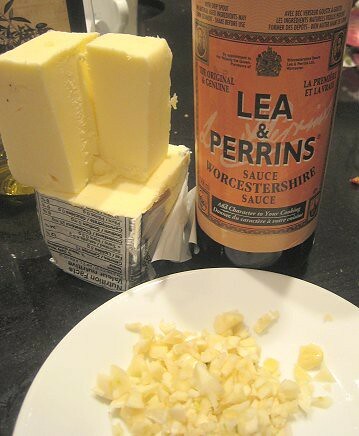 Melt the butter and mix together with the garlic and Worcestershire sauce. 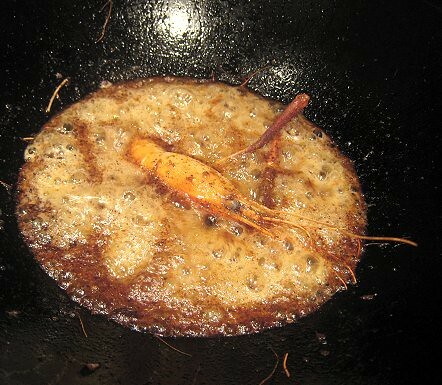 When the griddle is hot, put your prawns on it and pour the flavored butter over them. One can also baste the prawns with the flavored butter. Turn the prawns over to cook both sides. 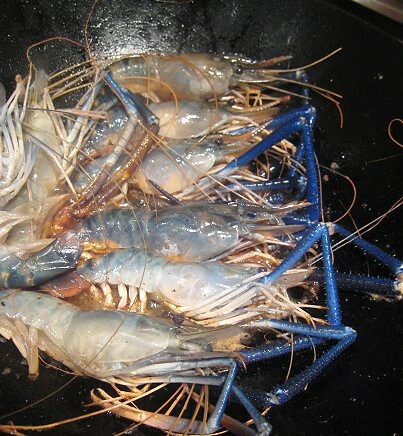 When both sides of each prawn have turned color, take them off the griddle. Serve.